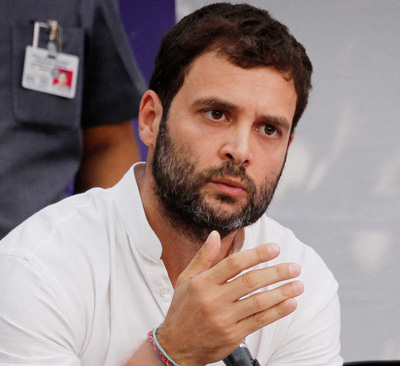 Ramanathapuram (Tamil Nadu), April 21 : Congress vice president Rahul Gandhi Monday said it is only the Congress party that had worked for empowerment of the people in the country. "India has developed both economically and socially only under the United Progressive Alliance (UPA) government. It is because of the UPA government's initiatives that there has been transparency in every government work," Gandhi said at a rally here. He said it is the Congress that passed The Lokpal and Lokayuktas Act, 2013 in parliament. "Suddenly whatever was hidden with respect to corruption became visible because of the Right to Information (RTI) Act, which has been given by the Congress", said Gandhi. He accused the opposition parties of just mentioning the corruption issues in their manifestoes but never taking any initiative to curb graft. "Opposition talks about corruption but I look carefully at their manifestoes and nowhere in their manifesto they tell how will they fight against it," he said. The Gandhi scion said it is only because of the Congress that the women in the country have been empowered.